A research team of multiple institutes, including the National Astronomical Observatory of Japan and University of Tokyo, released an unprecedentedly wide and sharp dark matter map based on the newly obtained imaging data by Hyper Suprime-Cam on the Subaru Telescope. The dark matter distribution is estimated by the weak gravitational lensing technique. The team located the positions and lensing signals of the dark matter halos and found indications that the number of halos could be inconsistent with what the simplest cosmological model suggests. 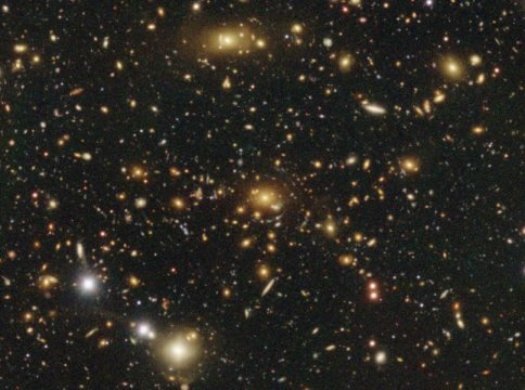 This could be a new clue to understanding why the expansion of the Universe is accelerating. It had been thought that the expansion is decelerating over time because the contents of the Universe (matter) attract each other. But in the late 1990’s, it was found that the expansion has been accelerating since about 8 Giga years ago. This was another big surprise which earned the astronomers who found the expansion a Nobel Prize in 2011. To explain the acceleration, we have to consider something new in the Universe which repels the space. The simplest resolution is to put the cosmological constant back into Einstein’s equation. The cosmological constant was originally introduced by Einstein to realize a static universe, but was abandoned after the discovery of the expansion of the Universe. The standard cosmological model (called LCDM) incorporates the cosmological constant. LCDM is supported by many observations, but the question of what causes the acceleration still remains. This is one of the biggest problems in modern cosmology. The team is now presenting the dark matter map based on the imaging data taken by April 2016. This is only 11 % of the planned final map, but it is already unprecedentedly wide. There has never been such a sharp dark matter map covering such a wide area. Imaging observations are made through five different color filters. By combining these color data, it is possible to make a crude estimate of the distances to the faint background galaxies (called photometric redshift). At the same time, the lensing efficiency becomes most prominent when the lens is located directly between the distant galaxy and the observer. Using the photometric redshift information, galaxies are grouped into redshift bins. Using this grouped galaxy sample, dark matter distribution is reconstructed using tomographic methods and thus the 3D distribution can be obtained. Data for 30 square degrees are used to reconstruct the redshift range between 0.1 (~1.3 G light-years) and 1.0 (~8 G light-years). At the redshift of 1.0, the angular span corresponds to 1.0 G x 0.25 G light-years. This 3D dark matter mass map is also quite new. This is the first time the increase in the number of dark matter halos over time can be seen observationally. The team counted the number of dark matter halos whose lensing signal is above a certain threshold. This is one of the simplest measurements of the growth rate. It is suggested that the number count of the dark matter halos is less than what is expected from LCDM. This could indicate there is a flaw in LCDM and that we might have to consider an alternative rather than the simple cosmological constant (Note 1). The statistical significance is, however, still limited as the large error bars suggest. There has been no conclusive evidence to reject LCDM, but many astronomers are interested in testing LCDM because discrepancies can be a useful probe to unlock the mystery of the accelerating Universe. Further observation and analysis are needed to confirm the discrepancy with higher significance. There are some other probes of the growth rate and such analysis are also underway (e.g. angular correlation of galaxy shapes) in the team to check the validity of standard LCDM.